“Everyone, everyday” — there is no gray area in this bold, inclusive statement. It represents the spirit of our patient care mission, and each of you make it possible. UMass Memorial Health Care is an entire system of caregivers. Starting today we celebrate this by launching a new program that recognizes and acknowledges your valuable contributions to our health care system. 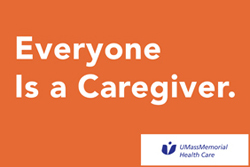 “Everyone is a Caregiver” highlights the unique way each of us – no matter our responsibilities or title – share in caring for our patients and each other. We showcase dozens of caregivers through images and stories that will be highly visible across our facilities and in our communications and initiatives. Nominated by their colleagues who see firsthand the work they do each day, these UMass Memorial caregivers are your coworkers and friends and represent each of us. Appropriately we are launching this recognition during Hospital Week and Nurses Week. We plan to continue to highlight additional caregivers. If you have a suggestion for a caregiver to spotlight you can visit www.everyoneeveryday.org to nominate someone who inspires you. I hope each of you know the important role you fill for our patients and their families on a daily basis. Your efforts are found in each patient visit, each phone call, in every procedure, every meal delivered, each helpful instruction, and every farewell and best wish to a departing patient. Our caregiver credo seen here sums it up perfectly. There is a direct connection between what you do, everyday, and our success in accomplishing our goal to become the best place to give care and the best place to get care.